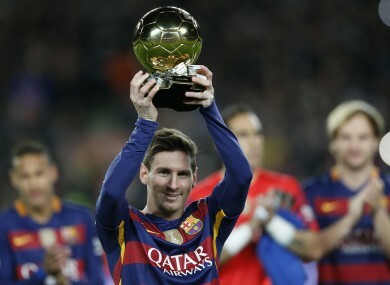 Messi was showing off his fifth Ballon d'Or before Barcelona's win on Sunday. HE HAS FIVE Ballons d’Or, but could Lionel Messi do it on a cold Wednesday night in Stoke? It’s one of football’s great questions — and the man himself has no doubts. Journalist Guillem Balague has revealed that he once asked Messi how he would fare if he swapped sunny Barcelona for the inclement conditions in the Britannia. Balague’s story came during an interview with Stoke’s Bojan Krkic, a former team-mate of Messi’s at Barcelona. “Messi can do it,” Bojan insisted on Sky Sports’ Revista de la Liga. “I understand that teams don’t like to come to the Britannia Stadium, especially in winter with the wind and the cold, and we’re a strong team. It’s not easy. Email “A journalist asked Messi if he could do it on a cold Wednesday night in Stoke”. Feedback on “A journalist asked Messi if he could do it on a cold Wednesday night in Stoke”.